The prevailing style is, as it's known, the Baroque, which takes on here such graceful forms and such particular features you can't find anywhere else. Because of this characteristic it has been called the Florence of the Baroque, as Gregorovius defined it. 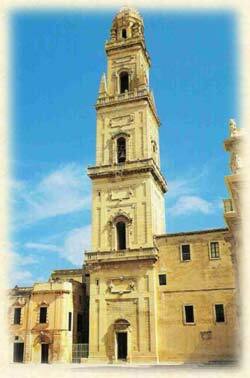 The monuments of the Chief Town of Salento form a patrimony which rightly arouses the passionate admiration of all visitors and which few cities can offer. This is a city which, at every turn, offers the visitors the surprise of a doorway, a gallery, a small arch, a mullioned window of charming workmanship. It consists mainly of buildings constructed between the end of the 16th century, when the Reinaissance style was going to be replaced by the Baroque, and the early 18th century, when the Baroque was begining to take on more restrained forms. It was during this period that Lecce was endowed, thanks to the patronage of the Church, with its most magnificent ecclesiastical buildings, in the construction of which masters and artisans, the former in planning, the latter in carring out these plans, vied for brilliance and creativa spirit. In this way there arose the complex of Piazza del Duomo, the Basilica del Rosario, the Churches of Santa Chiara, San Matteo, Della Grazia and the Basilica of Santa Croce: the most important monument of the period. Worthy of special attention is the monumental complex of Piazza Duomo, (Cathedral Square), composed of the Cathedral (G. Zimbalo 1659-70) and the adjacent Bell Tower (G. Zimbalo 1661-82), the Bishop's Place and The Seminary. 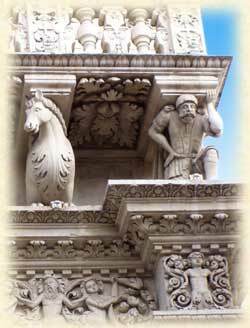 The building, begun in 1549 by the architect and sculptor Gabriele Riccardi of Lecce, was completed in 1689 by Giuseppe Zimbalo and Cesare Penna. 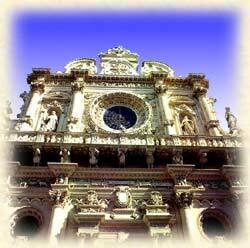 The basilica of Santa Croce is the most characteristic expression of the Baroque of Lecce. 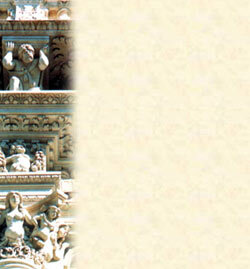 The first impression of the facade, the ornaments of which are particularly conspicuous, really takes your breath away. Restained, if not sober, in the lower part, with its six robust columns and the ornamented doorway, the central and upper part of the facade is full of such splendid decorations that you do not know where to look at. Even more than the facade, the interior is serene, didnified, inviting. The naves soar to a great hight, surmounted by the large dome, the cross-vaults unite with extraordinary elegance, the columns open into capitals of quaint originality.